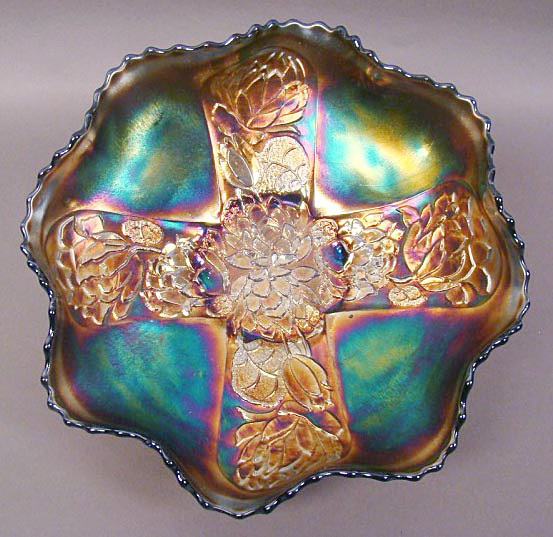 This curious ruffled bowl has no mold work for the grape part of the pattern. 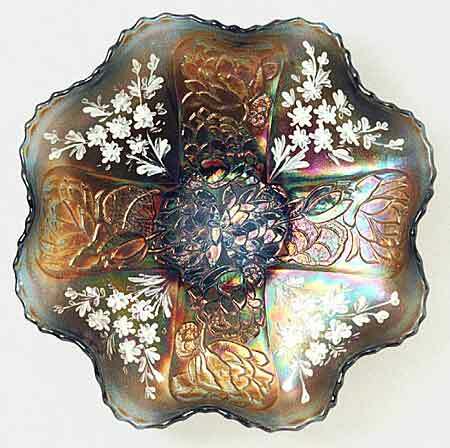 Instead, enameled flowers decorate that portion of the bowl. The glass is blue and the piece sold at a 1993 auction for $1,450. It was listed as one of two known. In 2017 an example like this, or perhaps the same one, sold at the Karen Engel auction for $3,600. Updated 6/25/2017 Like the above bowl, this blue Lotus and Grape bowl does not have the grape part of the design, though it does not, of course, have the painted decoration. It sold in 2017 for $925. Photo courtesy of Burns Auctions.